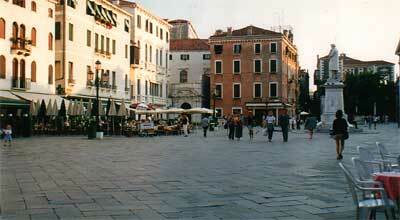 Venice has her own airport, named Marco Polo. But we arrived by train, which is particularly exciting. 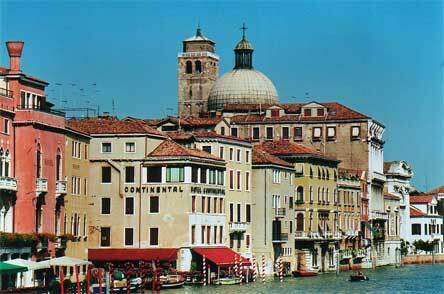 First, we passed through Mestre, the industrial counterpart of Venice. Most people who work in Venice live in Mestre and have to catch their last train home, so most shops close very early in the city. 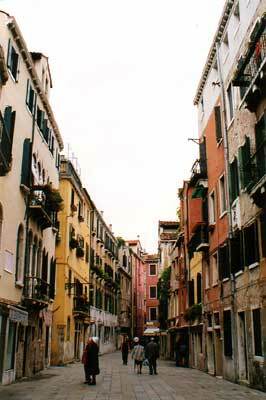 It has been said that Venice is the most beautiful city in the world, and Mestre the ugliest one. The unpleasant sight, however, is brief. Soon we found ourselves rolling over water as if the latter had suddenly covered the land on both sides of the rail tracks, and the impression was emphasized by the city we could see in the distance, rising out of the waters like Venus out of the sea. The Ferrovia Venezia S. L. is your usual Italian train station (we had already seen a good deal of these by the time we got there! ), full of bustle but not very overwhelming in size. On our way out, however, our first close-up vision of the city was like a slap in the face: the Grand Canal with its boats and vividly colored houses dipping their toes in the water, framed by the gates of the station which opened up onto a wide flight of steps flowing down to the dock. Understandingly, travelers waiting for their trains do it right there on the steps, filling their eyes with a last enchanting tableau, with the pigeons as companions. 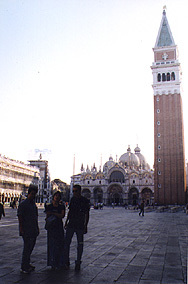 We had come to Venice with no knowledge of the local transports whatsoever. We thought that there were some streets and bridges wide enough for cars, because our guide-book advised to take a taxi. Obviously we hadn't paid attention to what it meant by taxi. Leaving the two men, Fawzi and Karim, to keep the luggage, my cousin Mounya and I went down to the docks to find transportation to our hostel. We were more than a little baffled (though pleasantly so) to find what looked exactly like a metro station but serviced by partly covered barges -- the vaporetti. The vaporetti were to be our tour-operators, our saviours after long walks, and a promise of finding our way again when we got lost (which would often happen: Venice is so small that we didn't really care to look at maps, knowing eventually we'd get somewhere interesting, and we'd see plenty of things on the way). Sant' Angelo (our station) almost became a rallying cry... But I'm skipping ahead. We examined the itineraries map, and found that line 1 (Lido-Piazza Romana) passed by Sant' Angelo, the closest station to Piazza S. Stefano where we had to go. We took tickets, signed the boys to follow us, enjoyed the look on their faces, and boarded with all our luggage. 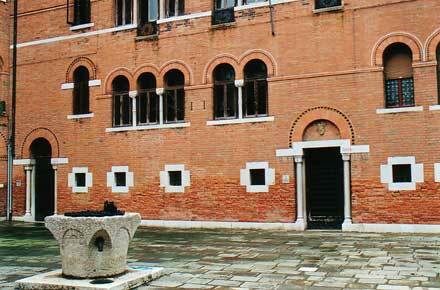 Mounya had booked two rooms for us at the Istituto (or Domus) Ciliota, Calle delle Muneghe, 30124 Venezia, S. Marco - S. Stefano 2976 (tel 041 - 5204888). It is held by nuns, and has a charming courtyard, and at the first floor a terrace we discovered, ideal for peace and quiet and a gaze at the stars. 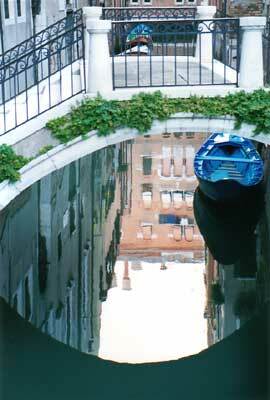 It is one of the most peaceful parts of Venice (in itself delightfully quiet), yet very well situated at equal distance from landmarks such as the Rialto, S. Marco... 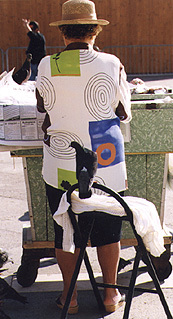 There is a great shopping area nearby, with the lowest prices we came across in the city. You have to be back to the institute by midnight though, or you'll have to spend the night outside! The one time I thought I had seen a street of regular width, a sign informed me that it was a court... The city being totally safe, one can indulge in the thrilling experience of wandering through the dark narrow streets at night. Besides visiting the Maya exhibit at the Palazzo Grassi, the first thing we did was go to Murano, world capital of glass-making (ironically, they learned this art from our Tyrians ancestors, who promptly forgot it afterwards!) It's a lovely island and we strayed a bit inland, away from the shop-aligned edge of the town, to enjoy it. On our way there (it's relatively far), we saw elaborately decorated gondolas, for the festival doubtlessly, and other surprises such as a military area (maybe the old Arsenale? ), tennis courts, and a cemetary-island. So, here we are, at the very beginning of a journey that will take us all over Italy and to France, by train, bus, boat, car, plane, camel (uh, bar that), dragging all our luggage behind us each time, and what do we do? All our glassware shopping, loading ourselves with very delicate and often large objects we'll have to watch over literally like a hen over eggs. Don't say it. We'll never do it again. 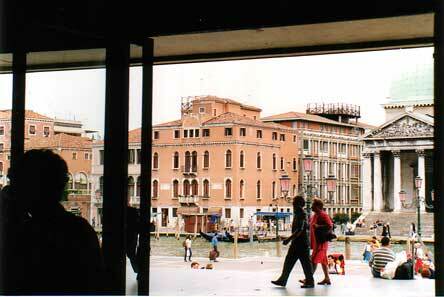 That said, Murano is much more expensive than the rest of Venice. It's better to leave it for the last day: buy all your glass things in Venice, and this way you can buy in Murano only what you've seen nowhere else. We enjoyed the pigeons, they're certainly the most friendly (and spherical) in the world. On every monument in Italy I've seen thin pikes, hardly visible to pedestrians, intended to prevent them (the pigeons of course) from landing on every ledge in sight. We spent the greatest part of that morning in San Marco and around, each on his or her side, professionally busy you might say: Fawzi making architectural sketches for his class, myself taking pictures and sketches for my class, Karim reading the news for our education, and Mounya shopping to serve as our tour operator afterwards. So she did, confidently leading us to the other side of the island towards the Rialto bridge (the signs painted on almost every wall did help -- you can't reallyget lost in Venice). However, at one point, we didn't know where we were any more. Mounya suggested we should climb on "that hill nearby" and see if we could find something. It turned out that this "hill" had water on two sides of it and was none other than the Rialto! 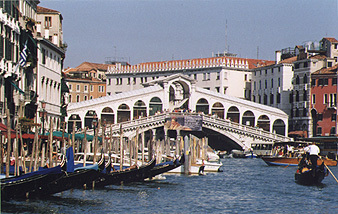 Our mistake is understandable, though, considering the fact that the bridge is lined with shops on both sides. 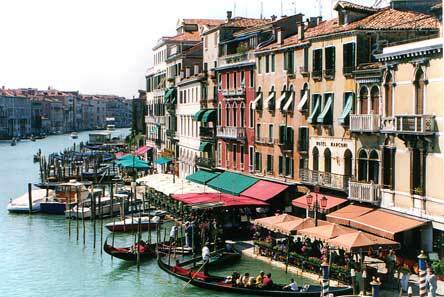 It is a shopping center over the Grand Canal, too crowded to be fully appreciated.